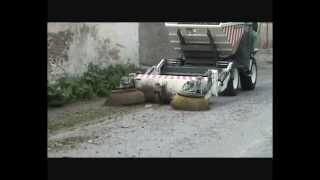 SELF LOADING MECHANICAL SWEEPER. MAX. WORKING LOAD: 2.500 KG. ENGINE: 25,5 H.P. TRANSMISION: MECHANICAL 4X4. Selfloading sweeper dumper. Four wheel drive. KOHLER (Lombardini), diesel engine, 25,5 H.P. Four cylinders. Water cooled. 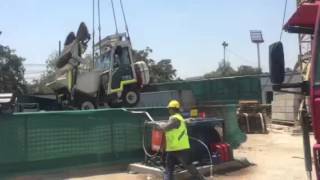 Swivel unloading and self loading. Hydraulic steering. Hydraulic brakes. Drag bolt. Plate hooks for accessories (Backhoe, Forklift attachment, Hydraulic hummer, etc). Provided with three floating sweeper brushes and adjustable all of them for the wear: the central one of roller for the pavement and two lateral circular letters for the sidewalkers' borders. Pulverized water. Interchangeable scoop to turn the sweeper into self loading Dumper with a rapid change. Double conductor’s protective ceiling. Certified head lights. Flashing beacon. Hour meter. Audible reverse warning signal. Safety belt.